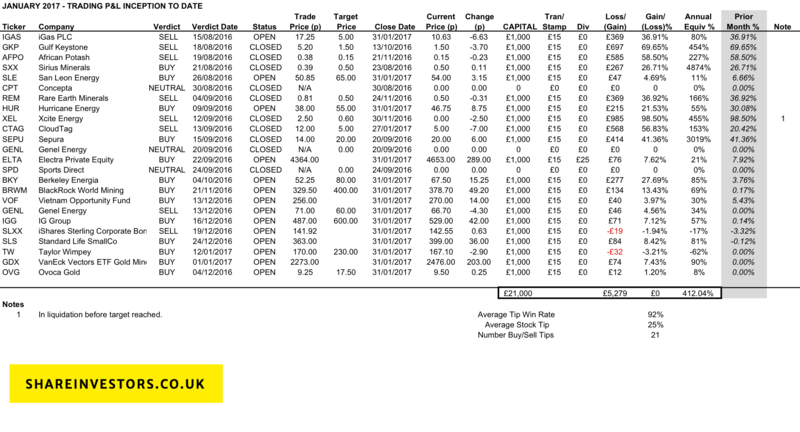 Here is the P&L as at 31st January 2017, which assumes you had taken a long/short position on my recommendation on the date of the article with £1,000 capital at risk. I do not always take exposures in all of the stocks I tip due to risk management purposes, i.e. not placing too much capital in one area. I may also have higher or lower exposure to individual stocks so this is not my actual gain/loss. The average stock tip is 25% Inception to Date, with 92% of my 18 tips in profit. Annualised return over 400%. Previous Previous post: Easyjet – Are the turbulent times set to continue? Next Next post: China out of favour, time to reconsider?